TightInformerPro is a tool to send simple text messages over the network and to display them on recipient’s computer as a ticker. TightInformerPro also offers the ability broadcast audio. TightInformerPro instantly sends text messages across network recipients, but unlike most of typical messaging software it displays messages as a news ticker. So a user sees not just a notification of an upcoming message, but the message itself. Chances the information passes unheeded are minimal with a ticker. TightInformerPro works in cooperation with TightProjector – a tool to broadcast images across the network – or individually. Each computer in the network can receive messages as long as TightReceiver, a client application, or TightInformerPro is installed. This way a network administrator, a company director, or any other administrative manager can send event notifications, corporative announcements, news, security warnings. The tool can also be used as a way to deliver simple text information on big screens in public places: shops, malls, airports and so on. Sharing information in a LAN setting using internet based IM clients might not be so efficient. Such communications are dependent of the network connection and other factors that could easily be overcame if used a local area network communication. TightInformerPro solves this problem with a brilliant projector, informer, receiver setting that is light on the nodes and effective to the fullest. The three in one tool is both lightweight and versatile. It won’t take much of your PC resources leaving you free to utilize your machine to the fullest. You also get a cool creeping line notification approach that constantly runs at the bottom of the screen giving a non-obtrusive but unignorably present way to communicate with node PCs. TightInformerPro is light. Each of the apps in the suite is a mere KBs making it perfect for underpowered receiver computers and even better for people who don’t want to tie up their resources for no reason. The dynamicity means that anyone with the app installed in their computer can either be a broadcaster, or a receiver. This makes the overall round communication or instant information sharing way better. The actual operation of the app makes it convenient in superimposing text or sharing screens with others. This means that you could use it to target anything PC. I tried it on my TV screen (connected to a dedicated entertainment PC), and my Windows Tablet PC and the effect was as desired. A crawling line just as what you seen passing by at the bottom of the screen when watching news. By using UDP, the app manages to broadcast to multiple clients without putting any tangible strain on the network. Almost endless PCs can connect to broadcast and receive as long as it is in the same subnet and has the TightInformerPro installed. I was expecting the information to be displayed as the creeping line to go into some text box instead all you get is a text document and you have to edit it as per some guidelines to elicit the desired effect. This is a bit hard a learning curve but is a worthy tradeoff for the lightness that comes with the package. I managed to get the audio and screensharing transmission jammed eliciting an annoying beep and buzz noise that went on for as long as the receiver was on. The problem lies in editing the TXT that controls the creep line with the transmitter still on. TightInformerPro is an amazing tool that is light and lovable. You can deploy it as an easy way to communicate and share screens within the network and can also be used on serious deployments like malls or airports. The only thing is you have to know it really good for such deployments to avoid crashing it at the time it matters most. Your work environment influences your productivity in more ways than you thought. Apart from the distractive movements and unnecessary conversations across the desks, the passage of information from the top offices to workers can unwelcome. TightInformerPro comes in as a handy tool. It provides a simple yet effective way of broadcasting text messages and audio over the network to connected computers. 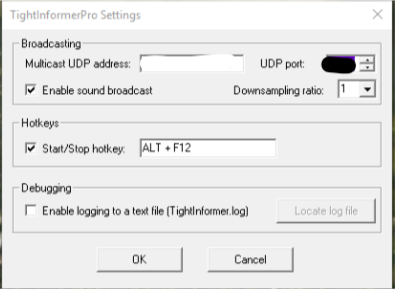 You can start using TightInformerPro right away after installing it without having to modify its broadcasting settings. Such an approach is helpful especially to less experienced network users. Although it might take you some time to fully get to know how the program works, subsequent steps will be easy. After using TightInformerPro for a while, it was apparent that its approach in sending text messages in a ticker format ensures the recipient gets the message. The chances of the recipient missing the message are very minimal. At the same time, the approach is less distractive especially if the messages are short and can be read at a glance. Provided TightInformerPro is running your system and is actively broadcasting, all computers in the network that have TightReceiver running will receive whatever audio playing on your machine. It is clear that this feature can have numerous applications in different situations. Changing the volume level on your system does not affect the audio level on the computers receiving the broadcasted audio. That is so because the application works from the sound card level. TightInformerPro also provides a simple and straightforward way of editing the message that you want to be displayed on the other computers. The message is in a text files in which you can easily follow the existing formatting style to include your intended message. You can easily know the transmission status of message broadcasting via TightInformerPro’s icons in the system tray. The change of color of the TightReceiver responsively changes from red to green to indicate transmission and no transmission, respectively. However, the same responsiveness lacks in launching the ticker on the recipients’ machines. Despite the simple approach that TightInformerPro implements in broadcasting text messages and audio files, you might find it challenging to get things off the ground. To start with, right clicking on the program’s icon in the System tray and selecting Start Transmission is not enough. The first step should be editing the text message. In order to successfully customize and save the message, you will need Admin rights. You might have to save the text file in another location before replacing the initial one found in the installation directory. TightInformerPro provides a simple and effective way of broadcasting text messages and audio to computers connected to a network. As such, the application can be very helpful in broadcasting messages in public places on big screens. This software would be your daily driver if your work revolves around the mentioned area.